Wicked Winnings II [Power Pay] © 2006 Aristocrat. 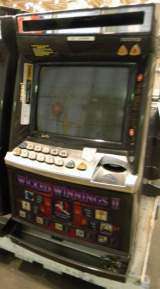 A 5-reel video slot machine with an evil style theme. Other Power Pay games are : "Black Rhino [Power Pay]", "Diamonds & Hearts [Power Pay]", "Wild Cougar [Power Pay]" and "Wild Tepee [Power Pay]". The difference between the original "Wicked Winnings" and this game is the Power Pay feature. The 4x Chalice win is also crippled to 250 credits instead of 500. She Devil appears on reels 2, 3 and 4 and substitutes for all symbols. All pays are left to right except scattered Money Bags which pay any. Hitting the Power Pay button doubles your reel bet and unlocks two possible features. The first Power pay feature is when 3 She Devil substitutes are spun up on the same reel. You receive a free spin with the triple She Devil locked in place. The second feature is won by getting a flame on reels 1 and 5, which gives you 15 free games. Free games can also be triggered during the feature. Gamble Feature : When a win comes up, you are given the chance to bet on the credits you've just won. The gamble feature allows you to select either the full amount, or you can select a half gamble by toggling the Gamble button. If a half gamble is chosen with an odd number, the gamble is rounded (a 5 credit win = a 3 credit gamble; a win gives you 8 credits, but a loss will leave you with the remaining 2 credits). If you select the right colour (Red or Black), your win is doubled. If you select the right suit (Heart, Diamond, Club or Spade), your win is quadrupled. If you select the wrong item, you lose the gamble and it goes back to the main game.